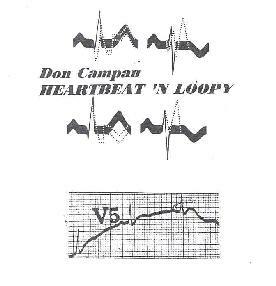 Don Campau - "Heartbeat 'N Loopy"
This is the second of Don's discs I've heard. There are 20 tracks which seem to make up two loose themes. The first 10 tracks feature Don's down 'n dirty rockin' reckless and relentless guitar style that can be mucho spacey and sometimes psychedelic. The next 10 are more experimental adventures in electronics and sound, often in collaboration with other musicians. Among the standout tracks from guitar portion is "Fear Of The Dogs", a fun guitar freakout track with fiery rockin' space guitars and bubbling synths against a harsh, pulsating beat. "My Business Is Pleasure" features cool guitar jamming against space synths and a steady industrial beat. "Salute To My Swami" is a wild combo of dirty rock guitar licks, and trippy Middle Eastern sitar and gently picked guitar patterns. When "Broken Suspension" began I thought it was going to be a cover of MX-80 Sound's "Why Are We Here", but it's just the basic riff from that tune and the rest is Campau's raw guitar style jamming away. "Snag" is a raw rockin' Led Zep styled tune with a psychedelia edge, plus a freaky child-like synth melody. I forget the exact track but the guitar riff in "Return Of The Impulse" reminds me of a song off Pink Floyd's The Wall, though the playing is far more let-yer-hair-down Campau dirty than Gilmour tasteful. "In Between Everything Else" has a bluesy Captain Beefheart sound but against of repetitive sort of drum 'n bass beat. And "Ignition Sense" features spacey electronics against a dancey techno pattern. Like Kraftwerk at a rave. Things take a more avant garde turn with "Pill Splitter", a collage of tribal percussion, voice samples, eerie synths, and various other noises. "Balcony" and "Tennis Elbow Macaroni" are easy-paced eerily atmospheric keyboard jams. "Mad Man" consists of scary vocals, primitive percussion sounds, and other fun freaky but unidentifiable sounds. "Bob & John Cut & Paste (part 1-4)" features sound effect tapes and homemade instruments glomed together and manipulated into a freeform experimental piece that mixes avant garde improv with samples that go from humorous to scary to freaky and back again. Stockhausen and The Residents would dig this. "At The Source" is a synth jam between Don and Carl "Nomuzic" Howard. Spaced... brain splitting... totally freaky. And "Homage To Dubuffet" is a journey into sound with Don playing plastic bag, wooden wind chimes, bowl top and bike pump. Doesn't seem like combining these would make for a cool glom of sounds does it? Well it does sound pretty cool with the headphones on. Maybe try playing some freakout guitar over it for Part 2. In summary, Don clearly has a variety of stylistic interests though I must say I'm growing particularly fond of his jamming lo-fi freakout guitar style. But I'd say the variety makes this a good disc to get a primer of what his music is all about. For more info on this and other Don Campau releases, plus loads of other cool indie sounds, check out the Lonely Whistle Music catalog web site. Don hosts the No Pigeonholes radio show on 91.5 FM KKUP in Cupertino California the second and fourth Sundays of each month from 3-5 PM. Check out the No Pigeonholes web site for info and links to hear the show in Real Audio. Contact via snail mail c/o Lonely Whistle Music; PO Box 9162; Santa Rosa, CA 95405.